Everyone is familiar with those little beads of loose fill packing "popcorn". Most people don't know where those were invented and under what conditions. The story goes that sometime in their early history Tek was looking for a better way to cushion their instruments for shipping. Someone came up with the idea of using actual popped popcorn. We don't know for which products and for how long they might have done this, but they hot-air popped corn and had it in large bags hung from the ceiling in the shipping department. The way the story goes, a woman was filling the box with popcorn when out came a dead rat. After composing herself and being frustrated with the situation, she pickup up the "evidence" and marched over to Howard's desk but found him gone. She left the rat along with a note that said something to the effect of "fix this situation or find me a different job". 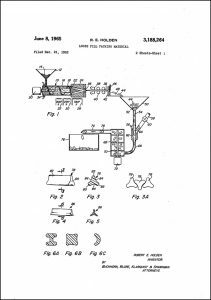 The end of the story is US Patent 3188264 for "loose fill packing material", filed on December 21, 1962 and issued on June 8, 1965. Now you know the whole story and who is credited with inventing packing popcorn. If you have any more information on the use of actual popcorn to ship products please contact the museum. Click on the image to view the PDF of the patent. This popcorn cartoon appeared in the January 26, 1962 TekWeek.